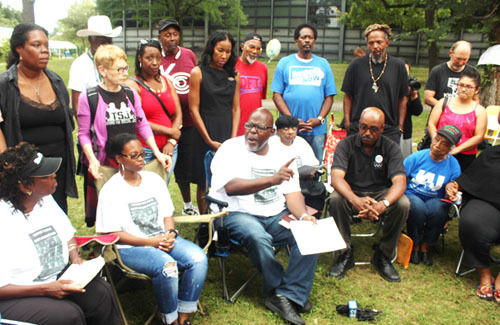 Dyett hunger strikers vowed to continue their action at a September 4, 2015 press conference. Hyde Park Herald photograph.Following a brief but melodramatic interlude after Chicago Public Schools officials (surrounded by a group of African American politicians who had never supported the Dyett hunger strike and its objectives) announced that a "compromise" had been reached in the controversy over the future of Dyett High School, the Dyett hunger strikers made clear on Friday, September 4, 2015, that they were not ending their hunger strike. Furthermore, as the details of the supposed "compromise" announced by CPS Chief Executive Officer Forrest Claypool became more clear, a growing number of people were asking why Chicago needs another "arts" high school and why the mayor and his hand-picked schools leadership teams wanted to outflank the proposed Global and Green high school plan developed by those who had also built the hunger strike. HUNGER STRIKE DAY 19. #fightfordyett. 1. While we are clear that Dyett is open as a neighborhood school due to the hard work and dedication of the Coalition to Revitalize Dyett, CPS' decision to turn Dyett into an arts school with a "technology hub" is NOT a victory for Bronzeville's children. We would not allow a school that we have struggled suffered sweated and strived to save the instruments of patronage for preachers and social service agencies who didn't lift a finger to defend Dyett's children as the school was being destabilized. We will not allow elected officials who has been useless in protecting and improving public education in Brownsville to now posture as if they saved a Dyett high school. 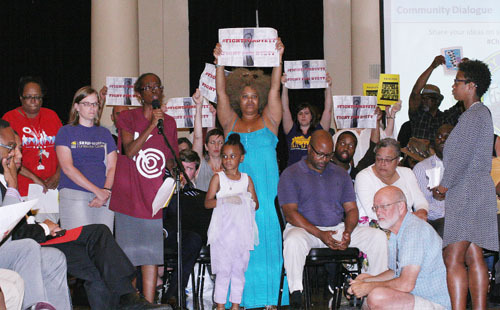 Some of the protesters at Chicago's South Shore Cultural Center on September 2, 2015, calling on the mayor and CPS to open Dyett High School as a green technology center. Substance photo by David Vance.1. We want green technology in the name of the school with our green technology curriculum fully implemented. 2. We want global leadership as a part of the students' curriculum. "We are in full solidarity with the activists' decision to remain on a hunger strike. This community does not deserve watered-down compromise deals among the mayor's political allies that CPS crafted in backrooms and without the participation of the very people who have successfully fought to re-open Dyett High School. The Dyett 12 has forced Rahm Emanuel to make a historical concession. This came about because of their consistent and focused advocacy. Now is the time for the mayor to listen to this community and implement the curriculum and supports they want to ensure their school will successfully educate their children. We applaud each individual, including the two educators engaged in this action, who have put their lives on the line and will fight for what their community deserves. One of the most important aspects of the situation following the dramatic City of Chicago budget hearing on September 2, 2015 (at which Mayor Rahm Emanuel was forced to retreat from the state at the South Shore Cultural Center in the face of the Dyett protesters) is that there are two very difference competing narratives, both regarding the history of the Dyett struggle and the current situation. The Dyett hunger strikers have challenged the compromise and denounced the political and media leaders who have spoken in support of it, noting that none of the politicians who stood with the latest CEO of Chicago Public Schools had ever raised a voice or vote to help save Dyett during the five years since CPS officials began the policy of undermining and destroying the school. The hunger strikes have given several interviews to local and national media during the first week of September, although some have charged that Chicago's corporate media -- and especially some pundits at the Sun-Times and Tribune -- have distorted the situation greatly. In Chicago, a group of public school parents, grandmothers and education activists are entering the 19th day of a hunger strike to save Dyett High School, the only remaining open-enrollment public high school left in the community of Bronzeville. Supporters say the city neglected the school for years before announcing plans to close it. Under Rahm Emanuel, Chicago�s mayor and former Obama chief of staff, the city has closed about 50 schools in predominantly African-American and Latino neighborhoods as part of what critics say is a push to privatize education. We speak to one of the hunger strikers. Jitu Brown is the national director of the Journey for Justice Alliance, a member of the Coalition to Revitalize Dyett, and one of the lead organizers of the hunger strike. TRANSCRIPT. This is a rush transcript. Copy may not be in its final form. AMY GOODMAN: That�s D13 performing The White Stripes� song, "Seven Nation Army," students at the Dyett High School in Chicago performing. This is Democracy Now!, democracynow.org, The War and Peace Report. I�m Amy Goodman, with Juan Gonz�lez. JUAN GONZ�LEZ: Well, in Chicago, a group of public school parents, grandmothers and education activists are entering the 19th day of a hunger strike to save Dyett High School, the only remaining open-enrollment public high school left in the community of Bronzeville. Supporters say the city neglected the school for years before announcing plans to close it. Under Mayor Rahm Emanuel, who�s the former chief of staff of President Obama, the city has closed about 50 schools in predominantly African-American and Latino neighborhoods as part of what critics say is a push to privatize education. The hunger strikers have called for Chicago to reopen Dyett High School as a global leadership and green technology school. AMY GOODMAN: Well, in a new development Thursday afternoon, Janice Jackson, chief of education for Chicago Public Schools, announced that Dyett High School will reopen as an open-enrollment arts-themed high school. But the announcement was seen by some as an attempt to end the hunger strike. The protesters have rejected the proposal, saying, quote, "This does not reflect the vision of the community." Jitu, welcome back to Democracy Now! Talk about what�s at issue, the significance of Dyett, of Bronzeville and Chicago history. The significance of Bronzeville is that in the 20 century it was one of the main destinations for African Americans as we evacuated the South. Bronzeville is the home of Richard Wright, Ida B. Wells, former Chicago Mayor Harold Washington, Nat King Cole, Redd Foxx, Louis Armstrong � the list goes on and on � Minnie Riperton, Sam Cooke, Dr. Daniel Hale Williams. So it�s a proud community, that has suffered from decades of disinvestment. And Dyett High School is the poster child for public school sabotage. I�ve served on Dyett�s Local School Council since 2003. In 2008, we had the largest increase of students going to college in all of Chicago Public Schools. For two straight years, we had the largest decrease in arrests and suspensions. We had a nationally recognized restorative justice program. In 2011, we won the ESPN RISE UP Award as a small school that was doing great things and needed a little help. We beat out 400 other schools around the country. And the next year, they voted to phase it out. We�re very clear that in America today we don�t have failing schools � we�ve been failed. And we have to be firm on that, because in that process, our children are demonized, shuffled around from school to school, and people actually make money off what should be a human right. This hunger strike came about because we had � we were left with no other alternative. Since 2009, the Coalition to Revitalize Dyett has attempted to engage Chicago Public Schools on a K-through-12 vision for education in our neighborhood, in absence of one provided by the district. We have met with literally thousands of Bronzeville residents. We�ve held six town hall meetings, gotten over 3,000 petition signatures. Over 578 people in Bronzeville mailed letters to Mayor Rahm Emanuel saying that we want Dyett Global Leadership and Green Technology High School as the hub for what we call a sustainable community school village. And that means that we want feeder schools vertically aligned with Dyett Global Leadership and Green Technology High School. We want the curriculum to be vertically aligned. We want parents and Local School Council members to train together. We want to create a network of schools, so that we have not only relevance and we have rigor, but we have relationships. This is a visionary plan. The president of the American Educational Research Association, Jeannie Oakes, said it was a wonderful plan. The president of the American Federation of Teachers, Randi Weingarten, said it was the best academic plan she�s seen in 30 years of teaching. But Chicago Public Schools, instead of working with the community, created an RFPprocess, after we gave them the proposal in April, and violated their own process by changing the date of a hearing. And that�s what prompted the hunger strike. It was the latest in just a round of deception, lies, misdirection, ignoring parents, ignoring community input, locking us out of meetings. And so, we�re on this hunger strike because we�ve been rendered voiceless. We pay taxes, but our voices don�t matter, while�the voices of black parents don�t matter, black students don�t matter, while the voices of parents in Lincoln Park are honored. An example would be when parents in Rogers Park said they did not want Intrinsic and Noble Street Charter School. They didn�t have to get arrested, they didn�t have to protest. They went to two meetings. And in two weeks, that deal was off the table. Parents in Bronzeville, black parents in Bronzeville, create a visionary plan for schools, and we�re railroaded at every turn. And yesterday was another example of that. JUAN GONZ�LEZ: And, Jitu, Jitu Brown, the issue of these massive closings of schools in the black and brown communities of Chicago, what excuse do they give for a school like you�like yours to be closed? And what were the proposals that they were entertaining to replace it with? JITU BROWN: So, I appreciate that, Juan. The reason, the rationale that they give is either the school is underperforming or is under-enrolled. But what we don�t realize is that CPS actually makes the schools underperform, and set up a situation where schools are under-enrolled. So, in 1995, when Paul Vallas was the CEO of Chicago Public Schools, they initiated something called school probation, which said if your students didn�t have a certain test score, there were punitive interventions that the district would make. Schools that go on probation, for most cases, never come off. It�s a graveyard. So what happens when your schools go on probation? The curriculum gets narrowed. So from instead of 9:00 to 9:50 you have reading, and then from 10:00 to 10:50 you have creative writing or social studies, now from 9:00 to 11:30 you have reading block, test prep. So the curriculum gets narrowed. The opportunities for inspiration diminish, because students now don�t have the options in the curriculum that could capture their imagination. And so the schools don�t perform. And so, then what happens? We say, well, the solution to this is, we�re going to close this underperforming school, and then we�re going to bring in a private operator who cares less about our input than the district does. Now, at the same time, while children are going through that at a school like Mollison, where the � on the Chicago South Side, where the school is so crowded that students have to get their special ed services under the stairs on the first floor, where students are eating lunch on the floor outside of their classrooms because the school is so crowded, where there�s no librarian � at the same time, you have a school like Agassiz in Lincoln Park, a neighborhood school that serves white middle-class residents, where the students have Mandarin Chinese, Arabic and Spanish, where every teacher has a teacher aide, where you have a fully stocked library. That�s not bad teachers. That�s not bad students. That�s separate and unequal education. So, closing schools has been a way to, one, accelerate the movement of African-American and Latino families out of communities, but then also to line the pockets of people that are politically connected. And that�s the same thing that�s happening in the case of Dyett High School. JITU BROWN: Yeah, what happened was just that, the press conference, I got a little�to be honest, I got a little emotional during the press conference, and I expended, I think, a little too much energy. And I hadn�t really hydrated like I needed to. So, I sat down, and when I jumped up, I was a little lightheaded. That�s all. So they checked my blood pressure, they checked my blood glucose and said that everything was fine. And they just made me drink a lot of water, which I�ve been doing every day. JITU BROWN: That I�ve been doing every day�yeah. AMY GOODMAN: You�re now moving in on day 20; it�s the 19th day. JITU BROWN: We�people are calling the group "the Dyett 12." There are 12 hunger strikers. After the mayor�s decision to basically open it up�and let me say, we�re clear that the school wouldn�t be open without us. So we have accomplished that. We�re clear on that. But we do not see this as a victory. This is not a victory for the children in Bronzeville. The people in Bronzeville did not say they wanted an arts school. People in Bronzeville said they wanted a global leadership and green technology high school, that�s part of a sustainable community school village, a system of education. So, we spoke with � I got a call from CPS CEO Forrest Claypool 15 minutes before the press conference, that we were locked out of by CPS, and he told me � I asked him, "Well, where is the room for negotiation?" And he said, "Well, we�re moving forward." So my message to him today is: So are we. We�re moving forward. This is a human rights issue. You know, the great poet and author Alice Walker said, "No one is your friend who demands your silence or denies your right to grow." This is not something that we take lightly. These are our children. These are our communities. We have to live with CPSreforms after the people that implement them get promoted to some other job. So we will determine the type of education that our children receive in Bronzeville. We are calling on the U.S. Department of Education, where we have opened Title VI civil rights complaints, where they�re being investigated right now, to intervene. At the press conference yesterday with the mayor, there were people�they locked out the people who fought, so they negotiated the deal with them. JITU BROWN: OK�and ranted incoherent statements. And so, those were not the people that struggled for that school, and those will not be the people that lead Dyett�s renaissance as Dyett Global Leadership and Green Technology High School. AMY GOODMAN: Jitu Brown, thanks so much for being with us. Jitu Brown is national director of the Journey for Justice Alliance. He�s in the 19th day of a hunger strike with other hunger strikers around Chicago Public Schools.